I have some exciting news. 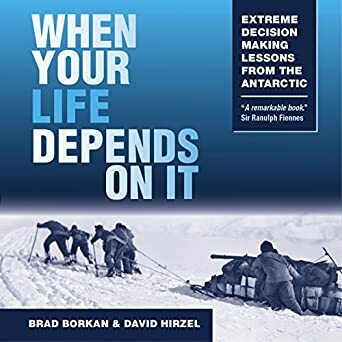 The audiobook version of my recent book When Your Life Depends on It: Extreme Decision-making Lessons from the Antarctic, (co-written with Brad Borkan) has been nominated for a prestigious SOVAS award. Good Morning America called the Voice Arts Awards “The Oscars of voiceover acting.” The annual event is sponsored by the nonprofit Society of Voice Arts & Sciences (SOVAS) will be held November 18 at the Warner Bros. Studio in Burbank. The narrator, Dennis Kleinman, lets his love of the spoken word shine through in this audio production. We are all in notable company in this category, which includes Cosmos by Carl Sagan and Lincoln’s Last Trial by Dan Abrams and David Fisher. This is one more example of a self-published book rising to national attention.